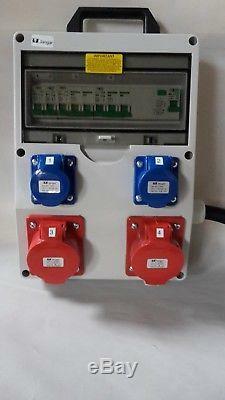 32Amp/63Amp Distribution Board RCD Protected. Ideal for caravan sites, camping sites, horse racing courses, marinas, fishing lakes etc. High quality polycarbonate enclosure, with lockable window flap over protection devices. 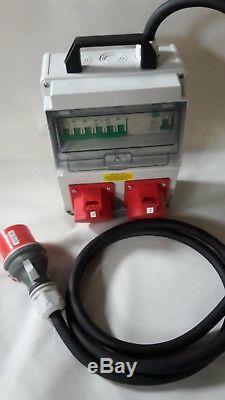 Each socket is protected by 4 pole 40A 30mA or 63A 30mA RCD and an overload switch. Option number 1, 6 x 16Amp 3 pin socket and 32Amp 5 pin plug. Option number 2, 3 x 16Amp 3 pin socket and 32Amp 5 pin plug. 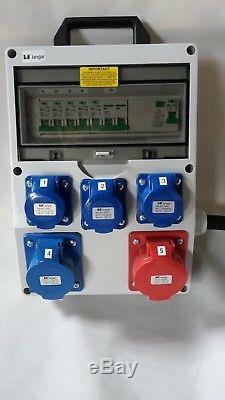 Option number 3, 2 x 16Amp 3 pin socket, 16Amp & 32Amp 5 pin socket, IP67, 63A 5 pin plug. 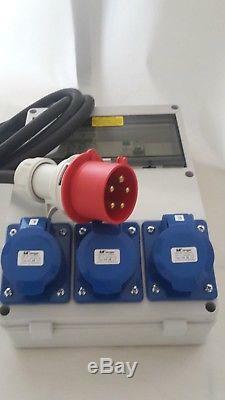 Option number 4, 2 x 16Amp 3 pin socket, 2 x 16Amp 5 pin socket, IP44 32A 5 pin plug. Option number 5, 3 x 32Amp 3 pin socket and 32Amp 5 pin plug. Option number 8, 3 x 16Amp 3 pin socket and 16Amp 5 pin plug. All boards are fitted with 5 pin plug, 32Amp or 63Amp, please see above. 16Amp 5 pin socket 3P + N + E IP44. 32Amp 5 pin socket 3P+N+E IP44. 240V 16Amp 3 pin sockets. 240V 32Amp 3 pin sockets. 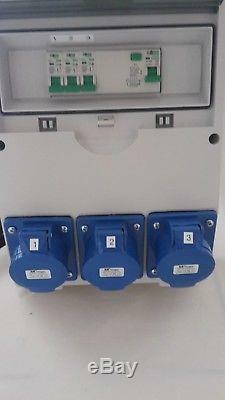 4 Pole RCD 40A 30mA or 63A 30mA. 3 pole type C 16Amp breaker. 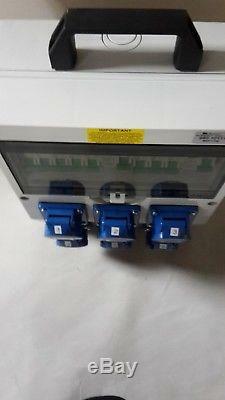 3 pole Type C 32Amp breaker. Single pole MCB's type B or C. Cable H07RN-F Rubber cable designed to use with portable equipment. 5 core x 4mm or 6mm cable with IP44, 16Amp or 32Amp 5 pin plug. 5 core x 10mm cable with IP67, 63Amp 5 pin plug. The item "63Amp Distribution board, power box, Hook Up, stage, event distro, 3 phase splitter" is in sale since Friday, August 3, 2018. This item is in the category "Business, Office & Industrial\Electrical Equipment & Supplies\Electrical Boxes, Panels & Boards\Electrical Panels/Distribution Boards". The seller is "247supplylimited" and is located in birtley, Durham. This item can be shipped to all countries in Europe, Australia, United States, Canada, Japan, New Zealand, China, Israel, Malaysia, Singapore, South Korea, Taiwan, Thailand, Chile.